Please note that this current website does not have a shopping cart. 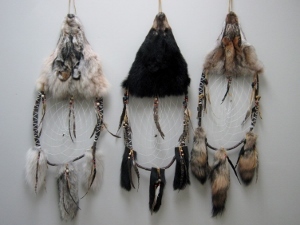 To buy our Huron Fur Dreamcatchers online, please go to our e-commerce website at NaturalExotics.ca. These dreamcatchers are handmade by a Huron artisan using small branches and real fur pieces from coyote, black bear and wolf. They are decorated with beads, leather laces and peacock feathers, with a coyote, black bear or wolf claw woven into the middle of the web. Genus and species of Black Bear: Ursus americanus. Wild. CITES II. Genus and species of Wolf: Canis lupus. Wild. CITES. These dreamcatchers are not for export due to CITES controls on the bear and wolf parts, and possibly on the peacock feathers.